Photograph from an album of 30 prints credited to Herzog and Higgins, taken in ca. 1901 and part of the Curzon Collection. 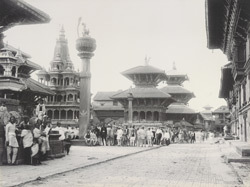 View of the Durbar Square of Patan, (Lalitpur), with the Krishna Temple on the left in the background. In front of the temple, and behind the large group of bystanders, is a free-standing column topped with a statue of Garuda (the part-eagle, part-man, vehicle and companion of Vishnu). The column in the foreground is crowned by the statue of Yoganarendra Malla (ruled 1684-1705) in an attitude of prayer, facing the Degutale temple, part of which is seen on the right. A cobra rears in protection behind the king. The ancient town of Patan with its strong links with Buddhism is now largely absorbed into greater Kathmandu. It is still a cultural centre and source of thriving arts and crafts in Nepal. One of the earliest towns of Nepal, legend claims that Patan was founded by the great Buddhist emperor Ashoka of India in the 3rd century BC. Inscriptions reveal that it was a major city of the Lichchavi dynasty (300-800 AD). Most of its monuments date from the Malla dynasty (1200-1769 AD). In the 15th century it became one of the three Malla city-states of the Kathmandu Valley, the other two being Bhaktapur and Kathmandu, and was endowed with spectacular architecture, particularly around its central Durbar Square. Although Patan's traditions are Buddhist and it has many monasteries or bahals, the Hindu deities worshipped by the rulers have prominent temples at the town's centre such as the unusual Krishna Temple, built of stone in 1637. Its central superstructure is in the style of a North Indian shikhara while the whole is a blend of Mughal and indigenous architecture with columned pavilions, and the facade is decorated with low-relief scenes from the Hindu epics, Ramayana and Mahabharata. The towering Degutale is seven storeys high and was erected in 1640. Much of the Durbar Square was built in the reign of Sri Nivasa Malla, 1661-84.